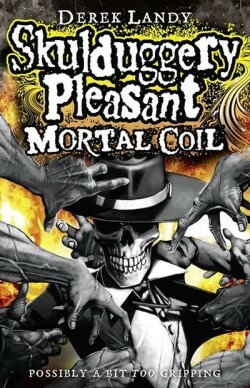 Skulduggery Pleasant has come a long way since Derek Landy wrote the first instalment back in 2007. What started off as a relatively good novel, crammed with humour, has turned into a fantastic series of novels that offer humour, emotional engagement and action. Mortal Coil, the 5th novel is probably my favourite so far as it surpasses the series’ pre-teen roots. Mortal Coil is far more of a character story than its predecessors- focussing primarily on Valkyrie and how she comes to terms with the revelations that were revealed at the end of Dark Days. In previous books, Valkyrie has always trusted her closest allies; but Mortal Coil makes her question whether she can trust them enough to help her. She takes huge risks alone, resulting in a near-death experience (excuse the pun if you’ve already read Mortal Coil!). Just when she is ready to confide her secret with her friends, 2000 remnants (loose, evil souls that take over the souls of the living) are released from captivity and wreak havoc on Ireland. Suddenly, she can trust no-one again, not even her boyfriend, Fletcher. The fact that Mortal Coil was a very personal plight for Valkyrie really strengthens her character. I have to say, I much prefer Valkyrie’s 16 year-old self to her 12 year-old self. In the original novel she was a mediocre character, giving the impression of being an uninspiring sidekick to the witty Skulduggery. In the past few books, Landy has really fleshed her out, and she really is one of my favourite characters of the novels now. Her relationship with Fletcher is endearing (I fully approve! ), although it was a shame that there weren’t many intimate scenes between them. A little more smooching and several more Fletcher-and-Valkyrie scenes wouldn’t harm anyone. Story-wise, Mortal Coil really steps up from Dark Days (although how that is possible is alien to me. Dark Days already had an epic storyline!). There are plenty of twists and turns, particularly towards the end, and the situation was pretty dire. Things don’t get much more nail-biting than this! Derek Landy rounds that all off with a wonderful ending, setting up the next book well while keeping it short and not dragging on. The last few pages were incredibly cinematic, and I could visualise the credits rolling after I finished the last word. Skulduggery Pleasant is definitely, in my opinion, highly suited for film, and you’ll be glad to hear that there have been talks of a film with Warner Bros. I will, of course, post more details on the blog as and when they arrive. All in all, it was an incredibly satisfying read. Mortal Coil is probably my favourite novel. In the last few books I’ve really gotten into Derek Landy’s style, and I really enjoy reading his fantastic novels. I just hope that Skulduggery Pleasant goes on for a long time- because I can’t get enough of Skulduggery’s sarcasm!